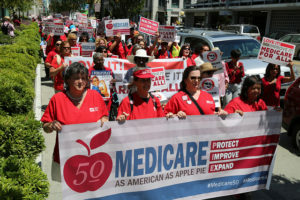 Bakersfield rally at Congressman Kevin McCarthy’s office to Protect, Improve and Expand Medicare and Medicaid. Kevin McCarthy (R) is Majority Leader and responsible for moving the Republican agenda forward in the House of Representatives. He is a well-known supporter of privatization and reducing spending on Medicare and Medicaid. We need to show up by the thousands to demand Congressman McCarthy move the House majority toward protecting and expanding these programs.